Just as the first incarnation revolutionised filter design, Revo II pushes the boundaries of filter technology even further. With a state-of-the-art synthetic media incorporating nanofibres, Revo II provides a remarkable dust holding capacity and life, whilst maintaining a low pressure drop. Whilst Revo II retains many of the features that made its predecessor such a success, the most notable benefit over the previous model is the additional service life. Thanks to a unique filter media, Revo II provides up to double the operating life than the previous model, which already boasted excellent longevity itself. This additional life is not at the expense of performance, however – efficiency levels are improved for all filtration grades, in fact. And, with both initial and minimum test efficiencies also enhanced, Revo II comfortably meets the requirements of EN 779:2012. With this added performance and life comes a two-fold benefit to filter spend. Obviously, a longer life reduces the outlay required for primary filters, but Revo II also eliminates the need for a separate prefilter too, further lessening filter spend. 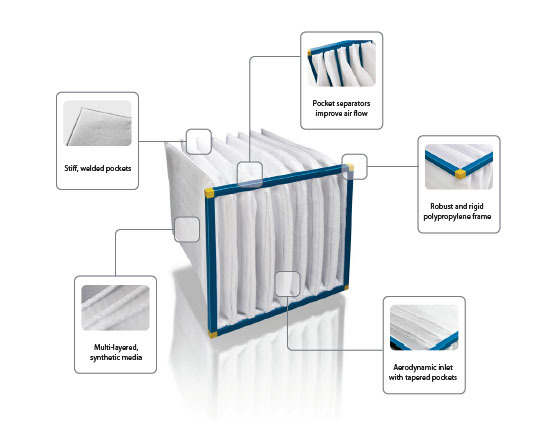 In addition, the removal of a prefilter stage immediately improves the pressure drop of the system, reducing energy consumption even further.